Stuffed Salmon with White Sauce, Broasted Potatoes, Green beans and carrots. Yummy! On Friday night I was doubly delighted by what I found in Brussels. First a stuffed salmon dinner at Cinnamon Jim’s which was a delightfully presented with broasted potatoes and perfectly prepared green beans and sliced carrots. 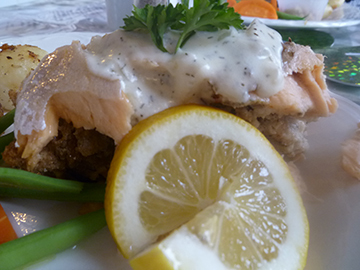 I’ve never tried salmon like this before … it had a tasty herb stuffing and was topped with a nice white sauce. Delicious! My sister was my guest for the evening and she tried the Prime Rib which reportedly was as equally palatable. To top off our meal we had the luscious baked cheesecake which was drizzled with chocolate and shamrock sprinkles in tribute to St. Patrick’s Day. Jim’s own home-grown lamb was an offering on the menu and I have it on good authority from another diner (thanks, Paul Nichol) that it too was a great choice, however it was already sold out when I booked my reservation. We went to the early dinner (6pm) as the second setting (7:15pm) was sold out. And, at 8:30pm an award winning Canadian Blues Band from Owen Sound was scheduled to perform in the “Upper Deck” which was the second delightful surprise that awaited us that evening. We were told we could go ahead to the performance space after our dinner and wait for the band to begin. So, I brought along my crib board and a deck of cards. And, we got to meet the band and watch them set-up for the show. And, what a show it was. Jim Lee, owner of Cinnamon Jim’s, is committed to setting a stage for live Blues music in Brussels. 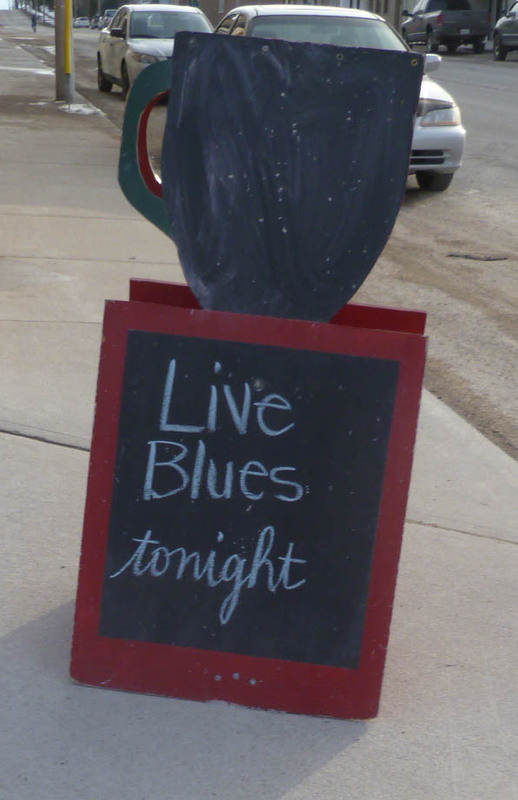 This week, the MacKenzie Blues Band, fresh off their trip to Memphis (Tennessee), thrilled the sold-out audience which included some familiar faces from Bayfield and others from Clinton and Exeter. The bands own material was modern Blues with a bit of rock and roll and they added tributes to Jimi Hendrix, Janis Joplin and Susan Tedeschi — all of which were definitely appreciated by this live audience. The lead singer, Tara MacKenzie is a classically trained vocalist and her back-up band was awesome – five incredibly talented musicians including her husband Trevor MacKenzie on guitar, Bassist Joel Dawson, drummer Mike Weir and Drew McIvor on the keyboard in his first appearance with the group. I’ve attached a brief clip here, but you’d best check them out at their own website. Musicians love to play to an attentive and appreciative audience … and for us there simply is nothing like a live experience. Thank you! Follow on Facebook to get information about upcoming music events.